A simple chapter book/graphic novel to engage the youngest new readers. In three unrelated stories, Yoon introduces a clueless big white duck, a helpful little yellow duckling, and their purple porcupine friend. These three won't replace Frog and Toad, but they have some of the innocence of the beloved amphibians. Each story, conveyed almost entirely in dialogue bubbles and sound effects, uses fewer than 70 different words and stands alone, though there is some overlap in the word choices, allowing beginning readers to recognize words they had to sound out in earlier chapters. Yoon does not rely on the standard conventions of beginning readers—there are no rhyming words or word families that can be memorized, nor is there a word list. Instead, the visual clues help readers predict what is about to happen. Menacing clouds that only Little Duck seems to see portend the outcome of the perfect picnic; Little Duck works mightily to remind Big Duck of Porcupine's birthday. Occasionally, the visuals are confusing—as when Little Duck is shown larger than Big Duck. 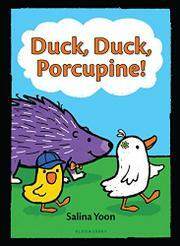 Some of the humor seems to be addressed to adult readers, as when Porcupine asks if No. 99 on Big Duck’s list of camping essentials is the kitchen sink.